Computer by Consys in Prescott and Chino Valley Arizona. Server computers with integrated automatic hot-swap backup. Consys offers computer sales, service and support. We provide on-site service and support in Arizona. High performance and style with the latest technology. Custom computers built to your specification using the same components as brand-name without the cost and useless software bloat. Stunning widescreen flat panel LCD displays. High definition and data backup options. 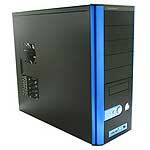 Intel Core 2 & Dual Core processors, high performance memory, high capacity hard drives. Flexible servers with a range of value and performance. Rack servers and tower servers for a variety of applications. Integrated automatic backup drives to increase reliability while reducing your worry and workload. Custom servers built to your specifications that use the same components as brand name. This greatly reduces cost, allowing you get more for your money. Consys consultants provide computer analysis, installation, service, maintenance and support. Service includes upgrades, repairs, maintenance and consulting. We provide reliable and trustworthy service. For 20 years our customers have counted on our no-nonsense approach to service.